Mobile has dramatically changed how consumers shop, interact and even date. So, rather than developing another “meat-market” dating app, Spoonjuice decided to put personality first and build a unique dating app. The company tapped my company, Sourcebits, a mobile development company based in San Francisco, to finalize the app concept and design and develop the first version. The result – Twine - launched in July 2013. After signing in with Facebook, an algorithm matches people by proximity and interests. Users get a limited number of matches per session and only see a blurry profile picture when they begin chatting. 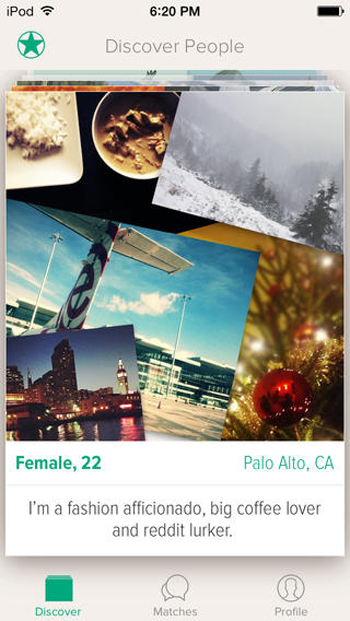 They can request a photo reveal, but the app emphasizes exploring personalities before judging pictures. Twine’s novel approach generated coverage in top tech outlets like TechCrunch and 9to5Mac. More than 200,000 people downloaded the app in the first few months. Users reported having interesting conversations and successful in-person dates. Testing also revealed many people liked the personality-first approach. But data analysis and extensive interviews revealed people wanted the app to be more visual. They also wanted to have more control in the matchmaking process, and not be limited in the number of matches. Spoonjuice faced a fork in the path of product development: incrementally update the original product or build something completely new. Taking the road less traveled by many mobile developers, Spoonjuice decided to design and develop a new dating app. Why Design a Whole New App Rather Than Simply Upgrading? The Sourcebits team and Spoonjuice debated both options extensively. There certainly would have been advantages to modifying the original app – namely, the existing user base and marketing strategies that were already in place. But from a design perspective, there was no advantage in simply upgrading when feedback indicated the app needed a completely new experience. In fact, so much of the time-consuming groundwork had already been done for the original product that when it came to designing and building a new app it took engineers just three months to complete the process, as opposed to the 12 months of intense effort the first product required. Building off the “personality first” philosophy, Spoonjuice and Sourcebits created Twine Canvas. The new experience: Users swipe through a gallery of personality “canvases,” a collection of five images reflecting people’s interests but (usually) not their faces. They “like” interesting people by swiping down, and if there’s a mutual match (the other person reciprocates the “like”) the app reveals profile pictures and people can begin chatting. Launched in Jan. 2014 for iOS, the App Store featured Twine Canvas for Valentine’s Day. Media coverage has also been high, with a five-minute TV segment on Fox News, national newspaper coverage in the UK and stories on popular sites like Mashable and Buzzfeed. User feedback has been strong, with many people trying both Twine and Twine Canvas. What Happened to the Original App? When you decide to build a completely new app, what happens to your original product? Of course the unique circumstances for every developer will influence their decisions. In the case of Spoonjuice and Twine, they decided to keep the original app as a separate, viable product. This allowed the original Twine to continue as a comparison experience to Twine Canvas, and provides a cross-app promotional opportunity. After publishing Twine Canvas, Spoonjuice asked Sourcebits to update the original Twine with a new color palette and a monetization feature – people can pay 99 cents to get more matches in their session versus wait for the auto-refill. Since Spoonjuice entered the world of dating apps over a year ago, the team has learned many lessons that carry across industries and products. 1. Leverage Analytics: Don’t make data an after thought. For Twine and Twine Canvas, Sourcebits built robust analytics and Spoonjuice used the data to guide product development. Give yourself an end goal to work toward. If you don’t have a point to reach, you can’t use data to steer product development in the right direction. 2. New Might Be Easier: Don’t hesitate to ignore your original product and build something entirely new instead. It’s sometimes faster, cheaper and a better experience to NOT port over existing users. In the case of Twine vs. Twine Canvas, the new product was so different from the original app that moving people and matches into the new app experience would have been too jarring. It can be painful to let go of hard-won, often-expensive, users in an existing app. But Spoonjuice focused on email marketing and in-app messaging to drive downloads from Twine into Twine Canvas. 3. Marketing Matters (A Lot): Spoonjuice leveraged Sourcebits for a full-court launch marketing strategy with both apps - public relations, user acquisition, email and social media all served a major role in generating downloads. App Store Optimization is also critical to success, as in-store search is a leading source of users. But success may take time – so give your app some runway. Although Twine Canvas launched in Jan. 2014 and had some light coverage, it wasn’t until late April that it garnered larger media attention with the Daily Mail and Metro in the UK. BuzzFeed and Fox News quickly followed. The greatest takeaway from the tale of two Twines is that you can’t hold on too tightly to your original ideal. Embrace a level of fearlessness to experiment and pivot. Make informed choices based on facts over emotion, and follow through – whether it’s standing behind the original product, developing an entirely new app or, as in the case of Spoonjuice, doing both. Piotr Gajos is the Chief Innovation Officer for Sourcebits. Sourcebits, a global design company delivering strategic mobile innovation and application development, has developed more than 550 mobile apps (including 30+ top 10s in ther category) for clients of all sizes. Based in San Francisco and founded in 2006, Sourcebits was named a 2014 Cool Vendor in Services by Gartner. Learn more at http://www.sourcebits.com.